We've all seen the pictures of Florence, Italy at night - where the sunset bathes the city in golden hues, the beautiful lights twinkle over the Ponte Vecchio, the ancient medieval bridge that spans the River Arno. And of course, the enormous dome of the Cathedral - the Duomo - is in every picture. That’s the Florence I wanted to see and photograph, the one I had seen in movies filmed in Italy, or at least about Italy. But if you’ve priced hotel rooms here during a busy time of year like September, you know that hotels in Florence Italy with this million dollar view usually come with a hefty price tag. Usually, but not always. If Italy's on your list and you plan on using Airbnb, Florence is a good city for that. The “House of Love” is one of the most fabulous Airbnbs we’ve ever stayed in! But don’t let the name fool you, it’s not what you may be thinking. It’s quaint and cozy, and staring out at the amazing view is the perfect way to unwind after a busy day of hiking, biking, walking around Florence, or exploring Tuscany. That table is crying out for some wine and cheese! The “House of Love” is aptly named because of the unbeatable view from its fifth floor combined- living room/kitchen/outdoor terrace, the property’s most outstanding feature. There are lots of amazing views of Florence to be had, but you either can’t stay there overnight, or if you can they’re not very affordable. Second on the amenities list is its amazing location - just steps from the Duomo in the historic centre of town north of the river. The prime location is literally around the corner from the Galleria dell’ Accademia - home of Michelangelo’s famous Statue of David - and just a few short blocks from the San Lorenzo market and popular Mercato Centrale. The Mercato, a two-story indoor market that’s popular with locals, is where you can shop for and eat locally sourced meats, produce, ingredients, and homemade dishes to your heart’s content. Just about every main attraction here is within easy walking distance as well - Santa Croce, Palazzo Independencia, the Uffizi Gallery, and the Ponte Vecchio are all a 15-minute walk away. 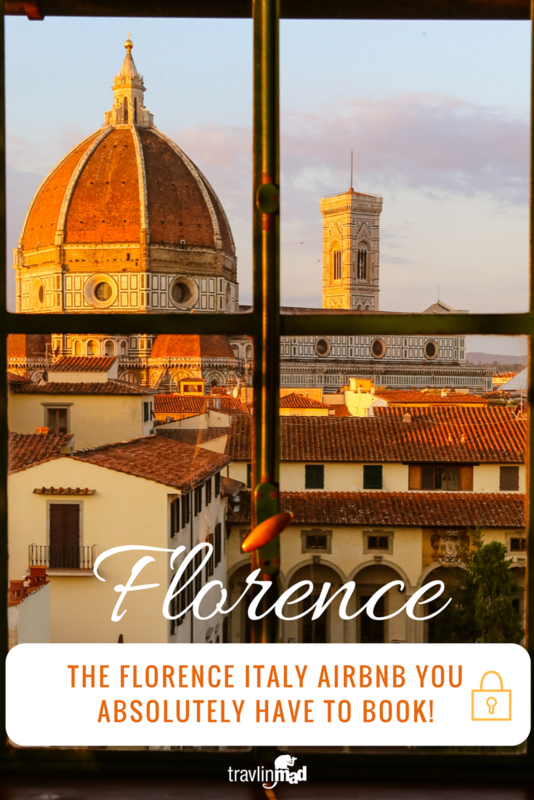 The Florence train station is about a 25-minute walk. The two-story walk-up apartment is located on the 4th and 5th floors of a beautiful historic building. The architectural details that reveal themselves floor by floor make up for the fact that unfortunately there's no lift to get you upstairs. That’s right, no elevator, just 110 steps. It sleeps two downstairs, plus two on couches upstairs if needed. Though the online description says it does not recommend the apartment for children, I think it would be fine for kids 12 and over. The spacious bedroom and bath are located on the 4th floor with a comfy, queen bed, plenty of light and storage, and excellent bathroom facilities. The small kitchen is well-stocked with everything you need to either cook for yourself on a full-size European stove, or just open a bottle of wine. The natural light filters through the pergola-covered outdoor terrace into the outer living room, and the glass window panels that surround the room open wide for unobstructed views. When I found the House of Love on Airbnb before we booked, the lack of an elevator almost blew the deal for me. I could just see my husband and me dragging our bags, exhausted after the first flight. Most of the reviews we read were encouraging. I have only one thing to say to that - they were right! If you're still not convinced from these pictures, consider this: where else can you see both the sunrise and sunset from the same apartment? The nighttime views are equally as stunning. Whatever you do, don’t let the lack of a lift let you miss out on this amazing panorama of one of the world's most beautiful cities. If you can physically handle it, you’ll be dreaming about the view for a long time to come. This Airbnb is a gem if you’re looking for a great place to stay. With one exception, we've always had good success using Airbnb in Italy and other places, and our one less-than-stellar experience was nothing compared to some stories I've heard! But if you go into your stay with flexibility and an open mind, generally we've found the experiences are all unique and overall a pleasant stay. Sometimes, we're blown away or underwhelmed, and sometimes you just get a bad Host. Ask questions, email, and stack the deck in your favor as much as you can! Prices vary depending on the time of year. Check out the Airbnb listing for details and interior views. Have you stayed in a fabulous Airbnb? Tell us about it here.